Based in Midtown Manhattan, NYC, Fine Art Shippers is a trusted provider of art packing & shipping services, with ready access to artists, collectors, auction houses, and galleries across the city and beyond. For today, our dedicated team of art handlers has shipped numerous paintings, sculptures, ceramics, bronzes, and many other art-related objects of exceptional value. Plus, we are recognized experts in shipping various antiques, vintage collectibles, mirrors, musical instruments, luxury furniture, architectural models, lights, electronics, and other items that demand special care and attention to detail. However, this would not be possible without the ability to properly pack and crate every single piece we are entrusted to ship. 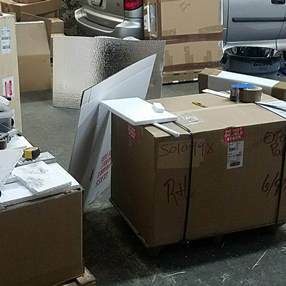 For this reason, we never outsource this important stage of the shipping process to third parties and offer our clients in-house art packing and crating services of the highest quality. Whether it is a custom built museum crate or a simple “soft pack,” all our art packing and crating services are designed to meet and even exceed the clients’ expectations. Our qualified art packers and crate makers with years of experience in handling different works of art guarantee the safest and most accurate packaging methodology, using specialized packing materials designed to protect art and antiques in transit. However, what makes Fine Art Shippers unique is our ability to build custom wooden crates to any specification. We can do it even for large and heavy sculptures that are very hard to handle. Our comprehensive art packing and crating services have long been a preferred option for many art business professionals, art-related institutions, and private clients from around the United States. Moreover, while we have our own fully-equipped warehouses in NYC and Elizabeth, NJ where we build wooden crates on a daily basis, our team can also do it in the client’s location if necessary, provided that enough space is available. What is no less important, our art packing and crating services are very competitively priced, no matter whether it comes to packing a painting for local transportation or crating a large outdoor sculpture for its further shipping overseas. The same applies to our art moving rates. Please do not hesitate to check this out by requesting a free quote on this website or simply give us a call! Our team will be happy to answer all your questions and provide you with any additional information regarding our art shipping, packing, and crating services.